Apple’s iOS 8 is arriving tomorrow, and while it isn’t as overtly dramatic a change as iOS 7 was last year, it’s still a big update with lots of new features and tweaks. Using it on the new iPhone 6 hardware revealed lots to love in the new mobile OS from Apple, some easing of restrictions that could lead to big advantages for third-party apps, and a lot of potential to change the basic mechanics of the iOS ecosystem. Apple’s new Messages app in iOS 8 more closely resembles the various messaging networks that have sprung up, and that’s a very good thing, because it means you get access to some fun features, and as long as you’re chatting with someone who already has an iPhone or iPad capable of running iOS 8, they’re also already on board without any kind of download or sign-up. 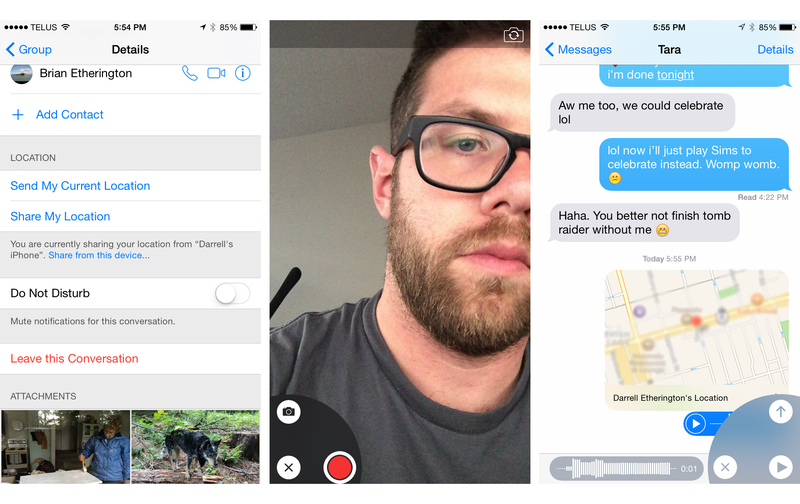 The new features in Messages include the ability to tap and swipe to send audio and video messages, as well as images. It means fewer steps and less friction than were required in the past, which should mean more use of multimedia in conversations. Best for me has been the ability to mute and leave group conversations, which is something I’ve been sorely missing since the introduction of group iMessage conversations. My family can tend to get pretty chatty on these threads, and while that’s generally fun, it can also be a huge distraction during work events, and during other times when I’d appreciate not getting a whole lot of noise mixed in with my signal. New sharing features mean you can also quickly beam your location to users on specific threads, or to individuals, for time-based sessions, or permanently. This is a better, more useful relocation of the Find My Friends feature that previously lived in a dedicated app, and it really comes in handy when you need to get to where a friend is quickly, in an unfamiliar setting, without having to worry about copy/pasting or typing in specific addresses. Apple’s Photos app improves in iOS 8, with comprehensive searching that lets you find photos and videos by searching for date, time, location, album name and by providing contextual smart search suggestions, like offering to find all the photos you took in a certain place. There’s deeper editing at-hand, too, with manual controls over exposure, brightness, shadows/highlights and more, all with the sliders you might expect to see in something more advanced like Aperture. This isn’t to say that the new Photos overwhelms novice users with too many options – by default, you’ll still only see the automatic enhance button and the app will now automatically correct horizon lines to make even the most rank amateur a better shooter, and advanced editing features are comfortably hidden another level deep. Photos seems more intuitive overall, with one exception that might affect those like myself with multiple devices more than others: it effectively merges all libraries using your account for iCloud photo sharing, making it impossible to drill down and see what was local and what wasn’t. This arguably keeps things simple for people who have an iPad and an iPhone and don’t care about maintaining distinct libraries, but it could be trouble for married couples who share one account strictly for iCloud syncing, for instance. Apple has taken the keyboard that has remained functionally the same since the introduction of the iPhone and done real work on improving the experience. It finally introduced typing predictions in iOS 8, and once you start using them, you’ll wonder how you ever got by without. It also pays attention to how you type when you’re communicating with different contacts and will alter its predictions accordingly. In my experience, this makes for a much improved iOS typing experience, and one that we probably should’ve seen introduced on the platform before now, to be frank. It’ll take a lot more testing to see just how sophisticated Apple’s prediction algorithms really are, but for now, they seem to learn the basics quickly as evidenced by decreased incidence of error over time. The other side of the keyboard coin is that Apple has allowed third-party devs to build their own system-wide keyboard software in addition to improving the stock option. It still isn’t exactly easy to add and enable third-party keyboards; Apple has buried the feature deep in Settings, but that’s by design – it wants to make sure you’re savvy enough to find the feature before you go changing away from the stock option. Even if it’s currently a bit obfuscated, the feature is a very nice addition. It allows you to use software that provides ergonomic benefits over Apple’s own for faster typing, and predictive engines that count on you being very casual about how you enter text, for instance. It can also really help those with visual impairments by giving them additional accessibility options for input beyond what Apple provides as system standard features. 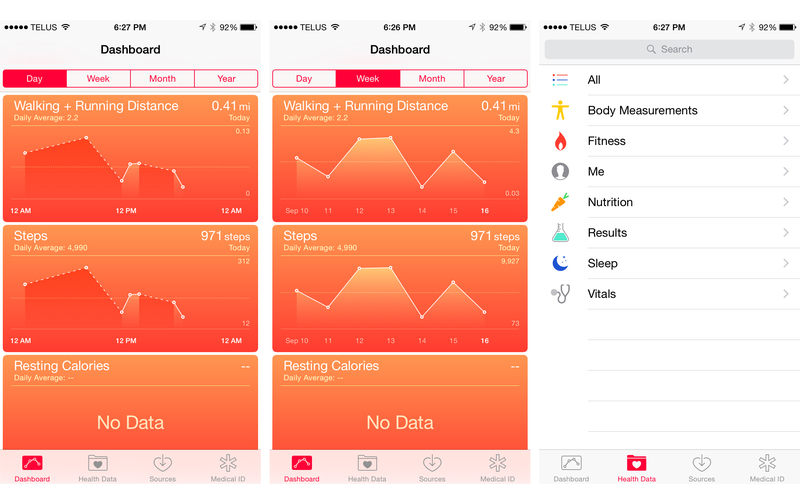 Apple’s Health app provides a central place to find fitness data tracked by a variety of sources, including your phone itself, which logs activity recorded by the motion coprocessor, including the M7 from the 5s and the M8 from the new iPhone 6 and 6 Plus. So far, I’m not getting data from many sources, or sharing it out to any third-party apps (which you can do on a case-by-case basis). But even in its limited current form, the value of Health is apparent. It basically eliminates the need for a standalone health tracking app if you’re interested in basic stats, and once the Apple Watch arrives, it’ll provide much more than a baseline at a glance. Apple could do more to expose the data it does gather in a way that’s digestible for end users, but the intent so far seems to have been to give developers new tools to use to build great apps, so the focus probably isn’t on how much Health can do as a destination at the moment, but rather on what it can provide other software. 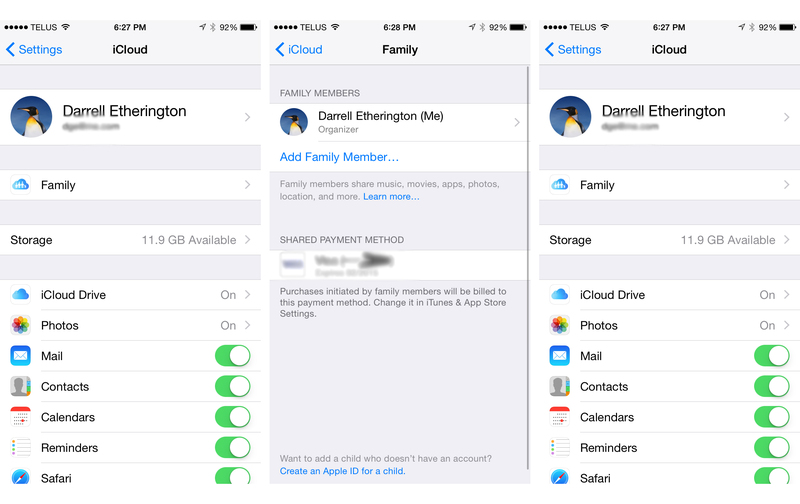 Apple has made it easier for a user to manage their entire household from a single iTunes account with iOS 8. The Family Sharing feature enables purchase sharing, meaning anyone authorized by the user (via Apple IDs) can download each other’s iTunes music, iBooks and App Store content. You can even create Apple IDs for kids linked to the primary account, and then let them use your stored card for purchases, with an “Ask to Buy” prompt that ensures you approve every choice personally. The Family Sharing feature also keeps a Photo Stream and Calendar synced across member gadgets, and lets you optionally track the location of individual members. Apple’s not doing any DNA testing here, too, so you can easily use this to set up a shared account among your close friends or other grouping, too, if that strikes you as useful. iCloud is no longer just the invisible thread that binds in iOS 8: iCloud Drive is more like Dropbox or Google Drive, giving you a place to store and recall documents and files. It includes cross-platform syncing, so that edits made in one place will populate in another, and makes it possible to load up Drive and click directly on a document to open the most relevant app. Apple has also done its best to make this truly cross-platform, giving users access on iOS, Mac, Windows and the web at iCloud.com. There’s no Android app as of yet, but pigs remain sadly bound to the earth, so that isn’t all that surprising. New Continuity features are designed to make performing even the simplest tasks in iOS 8 not feel locked to a single device – Apple is rewarding those who stay in its ecosystem with a way of seamlessly shifting things like browsing the web, writing email and answering messages and calls between iOS and Mac devices. To get the full effect of this feature, users will have to wait until Yosemite ships (likely next month), but Handoff already lets you do things between iOS 8 devices, so you can start something on your new iPhone 6 and pick it up on your iPad Air. Instant Hotspot is another Continuity feature, and sure enough, it lets me see my iPhone hotspot directly from the Wi-Fi menu list of my iPad, and automatically start the hotspot and connect to it from the tablet, without it having to be enabled on the phone first. Phones running iOS 8 can also now push SMS and voice calls from non-iOS devices to other Macs and iPhones logged in to your iCloud account. This is another one that’s waiting for Yosemite, and since Apple is also launching Apple Pay at that time, it’s probably coming then, possibly with an iOS 8.1 release. New Spotlight search features mean that when you look for something using your phone’s universal search, you’ll get results from additional sources. Most useful, perhaps, are the quick links to Wikipedia results, but you’ll also get website suggestions, App Store options for mobile software, breaking news and local results. This is already one of the better features of iOS 8, even if it’s a small service addition, and it makes your iPhone almost a portable search portal for everything. Just being able to pull down from the Home screen to find what you’re looking for, instead of even having to go through the additional step of opening a browser or the App Store, is a big advantage. Notifications on the lock screen and the notification center were both important evolutions of how Apple lets your iOS device make you aware of new information, but new quick reply features let you interact directly with text, email, calendar, messages and third-party apps without unlocking. It’s a terrific time saver, and in practice it has helped me avoid falling into the trap of unlocking my phone and getting trapped in the Bermuda triangle of Instagram/Twitter/Facebook checking. Extensions should also add to the action, by giving third-party devs a chance to get in on the ‘Today’ view in the Notification tray. These can offer shortcuts to app functionality, like giving you control over your Philips Hue lights with a simple swipe down from top, for instance. These apps will be populating the store tomorrow, to stay tuned for more on how they change the iOS experience. Apple has improved some of its own apps and features, but the improvements to Voice Dictation might be among the most impressive. In iOS 8, it seems to almost read your thoughts in terms of getting your spoken words transcribed correctly, and that’s bound to be useful for those seeking this as an accessibility enhancement, or for those who find themselves driving and messaging a lot. Apple has a lot more coming in the iOS 8 launch, which is set to arrive tomorrow (no specific time specified yet). It’s a particularly exciting release in terms of what it can offer developers, so its real impact will be felt later on – and next month should also change things up considerably with the debut on Continuity on the Mac, and with the introduction of its contactless mobile payments system, Apple Pay, in the U.S.
It’ll be a free update for iPhone 4S and up, and the download should announce itself on your device. Expect delays, as the server demand when it does arrive is generally enough to bring down even the most robust data center, but we’ll be sure to let you know when it’s available if you want to be one of the first through the door.